"Deliriously delicious juice to start your day! The result will be a lovely, creamy, silky smooth beverage - and with a lovely orange glow, it's a real eye catcher, too!" 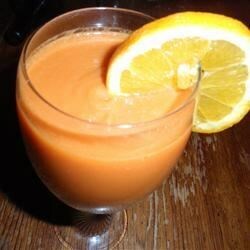 Run the carrots and apple through a juice extractor and pour the resulting juice into a glass. Stir in the coconut milk and garnish with freshly grated ginger root. This healthy carrot and apple juice features a tasty Thai twist. Smooth, creamy and delicious! I'll be making this again, probably adding even more ginger! I've been searching for recipes to use with my new juicer - this one is delicious. I plan to make it often! Very good. I like the addition of the coconut milk. I forgot to add my ginger. My kids didn't like it but I didn't expect them to. I do not have a juicer so I just threw all he ingredients in at once into a blender. I used vanilla soy milk since I do not have coconut milk, and it turned out wonderful!